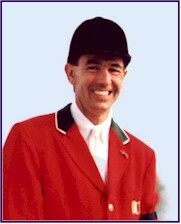 When it was decided that the Pan American Games 2003 were going to be organized by the Dominican Republic, they immediately declined to organize an eventing competition, just show jumping and dressage competitions, because of the expense of building a cross country course in a poor country without any eventing going on. 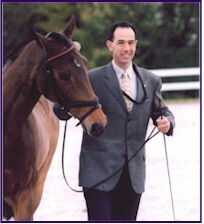 Then, about two years ago the Fair Hill International organization opened the possibility of organizing a Pan American Eventing Championship at the three-star level, as the North Georgia horse trials organizing committee did in 1991 when the by then Pan American Games organizer, Cuba declined also to organize the eventing competition, although that year the Pan American Eventing Championship was held at two stars level. 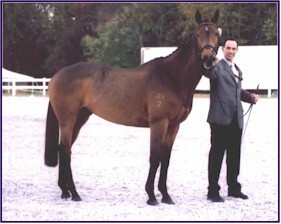 I brought to Windchase Farm my nice New Zealand thoroughbred mare Secret Notion in the summer of 2001. She had been with me in Mexico since November 2000, having done a handful of Preliminary horse trials down there and finishing 12th at Camino Real CCI** in Buffalo, Texas. 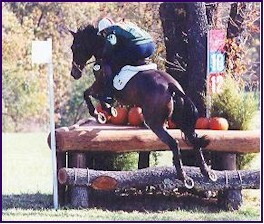 As soon as she got to Virginia she got a fourth place at Menfelt Intermediate, and completed with a clear cross-country the Plantation Field Advanced, heading to Radnor CCI** where some lack of experience caught us, causing some glance offs on narrow fences in cross-country. 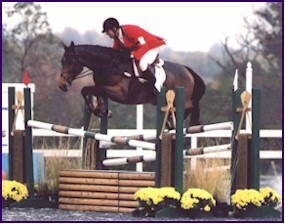 Then things started to work out in a much better way in 2002; we finished 3rd at Middletown in the Preliminary, and completed the Stuart CIC** and Millbrook advanced. We had a second go at the Radnor CCI**, and we went round with a very nice clear cross-country. At that point in time, Phyllis and I started talking about the possibility of trying to get ready for the Pan American Championship. Secret (known as 'The Princess' down south) headed down to Debbie Adams' place in Ocala, Florida, where with her coaching and Stephen Bradley's and Bruce Davidson's support, we were able to compete at Rocking Horse, Pine Top and Southern Pines in the Advanced, completing all the FEI required qualifying competitions for a CCI***. We started at the Foxhall CCI*** with a nice dressage test and were going across country clear under the time until Secret hung a front leg at the out fence of the Sunken Road fence, throwing me out of the saddle head first; so after loosing consciousness we had to retire! 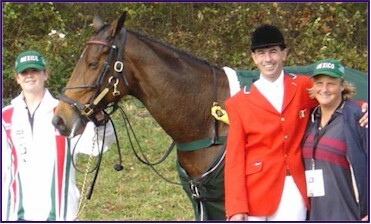 Back at Windchase, Phyllis and I set up a competition schedule that would prepare us for the Fair Hill CCI***. We did the Open Intermediate horse trials at Fair Hill, MD, and the Five Points USET Pan Am Mandatory Outing division at Southern Pines, NC. I had planned to do the Advanced at Menfelt as well, but I was only able to do the dressage there, as I had an accident on the Tuesday before, where I had cut my tongue in half, so it had forty stitches and I was under heavy antibiotics and painkillers. Your will can't always overcome the physical problems! I think at this point of time, you must learn that during all the time I have just related to you, I have been actually living in Mexico City and flown to the competitions, sometimes with not even one extra day to ride Secret. But being a self-employed entrepreneur and amateur rider with an incredible young family, it is necessary to sacrifice training perfection with a will to make things happen. Although it is sometimes frustrating not being able to be competitive against the regular advanced riders, it makes you feel very good just warming up with guys that ride several horses per division and make a living out of the sport. Anyway, we were ready to represent my country, Mexico, in the Pan American Eventing Championship as an individual, as no other Mexicans were able to qualify. Trying not to over stretch my luck and will this time, I flew into Dulles airport on Wednesday the week before Fair Hill to train with Phyllis as much as I could. In early August I brought from home two nice preliminary prospects, Ebro and Gracie, to try to have as much competition experience as possible, and to give the horses some good mileage. On Friday I went to Waredaca to compete with Secret in the nice and relaxed advanced combined test, that allowed us to iron out some problems under Phyllis' watchful eye. Then on Sunday I took Gracie and Ebro to compete in the open preliminary, where after two good performances I got fifth and sixth places, the best being the fact that the fast cross country rounds put me in the right frame of mind for the following week. On Monday Secret did her last gallop, ending with two nice pulls at almost steeplechase speed up Windchase's new up-hill galloping track. So, ready to go! First thing in the morning we trotted out Secret on the driveway, she being completely sound, as she has always been after racing as a three and four year old in New Zealand and competing in five three-day events. With that peace of mind, I took her out for a very nice hack around the Windchase lanes, that was a pleasure enjoying riding my mare and watching the fabulous Northern Virginia Fall views. We then finished packing all the stuff necessary for a three-day event. I was very lucky that my good friend Melissa Hunsberger asked to go with Secret as her groom; having a professional top eventing stable assistant trainer that just completed with two horses in the Morven Park CCI* is an invaluable help that takes off a lot of pressure! We had said that we were going to leave at 11:00 a.m. to avoid Baltimore's beltway traffic, but as always with me, we ended up leaving Windchase at 1:30 p.m.! It took us just two hours to arrive to Fair Hill, and the sensation of just seeing the steeplechase track on the left side of the road started to pump up my adrenaline. After getting to the temporary stable area on Gallagher Road, we unloaded Secret and handed her FEI passport to the vets. They did the compulsory examination very quickly without any major fuss that you do not need at that point of time. They gave us a very nice stable in the lower corner of the smaller tent, with a large area under roof in front of it. As it was beside the security fence, I was able to pull the trailer just beside it and unload very quickly in to the tack stable. 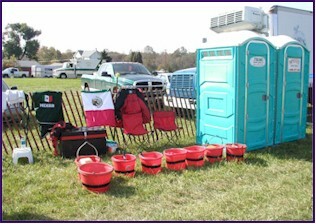 Immediately I looked for my Mexican flags and hung them so everybody could see that the Mexican Team had arrived! When Secret was settled down and the trailer parked away in a nearby field, I started looking for friends, that was not very difficult, as soon I started hearing the familiar loud Argentinean accented Spanish from my very good friends the Ortellis, in one of their typical family discussions! As their horses were stabled just behind ours, we had a lot of fun during the whole competition. On our side were stabled the kiwi Donna Smith, and Cathy Wieschhoff, then the Ortelli's behind us, in front of them were my good friend Carl Bouckaert's horses, and the Brazilian Team were in the third an last alley of our tent. A truly International place! Then as I was still the only Mexican representative around, I went to the Chef's de Equip daily meeting to do the countries 'order of go' draw for the First Horse Inspection, getting the second spot after the two Argentinean horses. On the early evening I was invited to attend the Americas Eventing Community open forum to discuss our points of view about the last changes the FEI Eventing Committee has proposed for the future of the sport. I had to give the Mexican Equestrian Federation point of view as well as mine, the MEF being in favor of the proposed changes, although with a need to have more flexibility about the format that the FEI championships must use, and the fact that a four-star level CIC or CCI 'short format' has not been used yet in the real world and they are already planning to hold the next Olympic Games and World Equestrian Games under it. In my personal case, I said that we need to be open for change, because if it is well handled it will not hurt the sport, as triathlon evolved from the Ironman competition to a shorter format that is used in the Olympic Games and some championships having helped to increase the sport popularity. I feel that three-day events (CCIs) are the ultimate eventing goal for me and my horses, so at least the World Equestrian Games must remain under this format. The discussion was quite heated up, with almost everybody saying that the riders point of view has not been taken very much in account, as almost all of them are for the CCI long format; although we must recognize that sometimes the most important point of view must not necessarily be that of the players, but the one from the general public who are the reason for sponsors and media to get into any sport. After a nice dinner at Wesley's, the typical Fair Hill horse trials stop, Melissa and I headed to our hotel in Elkton, to find that the manager on duty had messed up our reservations, taking us more than half an hour to sort out everything and get both our room keys. The start of a travel-agency-like saga that I was going to live during the following days, because we had reserved seven rooms for the whole bunch of friends that were going to arrive in the following days. Next morning, we headed for the competition around seven to feed Secret, who was relaxed and in a very good mood. At eight we went to the Security trailer to get our security badges with photograph, taking a little bit of time to get them, as we were almost the first to get there the system was still having kind of a cold start up. When we were done I went around scouting for the best ways for going to the dressage area where the First Horse Inspection was going to be held in the afternoon. Then I kept fooling around and talking with lots of the good friends I have made after more than ten years of eventing at the International level both at home and in the USA. At ten o'clock I went to the big Members' tent for the riders briefing and official competition start up, it was a quick thing and as soon as it ended I headed out to walk the cross country course. When I got to the third fence my eyes started to open really wide, as difficulties started to appear in sight, not being able to even blink from that point on, as the course was the toughest three-star I have seen in my life, beside the fact that the first time you walk your course it always looks way bigger. My personal nightmare was fence 12, a wide left-handed corner sitting alone under a tree after a right handed U turn from the previous big table obstacle, and without options. Not being Secret's and my own greatest strength, Phyllis has kept us during the last two months practicing the right way of jumping them with straightness and out of good canter in front of the leg. But when you see that your main challenge lies down there in front of the Ten Minute Box, and you will have to jump it, like it or not, to be able to make your dream happen, it makes your stomach start feeling like a Christmas jingle bell. When I got back to the stables Melissa had already finished braiding Secret and she looked really good, a perfect picture of a nice thoroughbred ready to tackle a three-star Three-day Event, and well taken care of. I rode her for a quick hack heading to the big arena and trade fair areas on the other side of the road, but when she got out of the tunnel and saw where she was, she went absolutely nuts as she always does when she finds out that she is in another Three-day Event. We went back to the stable and as Melissa cleaned off the saddle marks and put Secret in her nice green dress sheet with a big embroidered Mexican flag, I dressed up, and at half past one we headed to the big arena on the other side of the road. Again, as we got there Secret started prancing around like crazy, so Melissa had to keep her well away from the other horses, but like a well seasoned competitor when our turn came to go in front of the Ground Jury and Veterinary Delegate she started behaving like a Princess, trotting nicely and jumping the first competition hurdle with a: "Secret Notion has been accepted", that always sounds very nice. Pedro and Secret at the Jog-up. I changed again into riding clothes as Melissa tacked her up again, and in a more relaxed mood we headed towards phases A and C to memorize them. I went along with Gustavo, one of the Brazilian riders. Trying to understand each other speaking in Spanish and Portuguese, that although are more or less similar, it makes it very interesting to try and be understood, and to understand what the other guy is trying to say. It was again one of those moments when you give God thanks for being so lucky to be riding a nice horse in a nice place with good company, because love for horses, horse people and riding across country is the main reason I am into eventing, regardless the pace of it. I came back just in time to go to anther Chef's de Equip meeting, this time in the nice National Steeplechase Association meeting room. This time we had to draw the starting order according to FEI rules, so first the teams members and their starting orders were declared, then another draw for choosing the individuals order of go was done, and luckily I got the second choosing spot, so I was able to get the second to last place before the fourth team riders group, 21st out of 25. Beside that, it was defined that for the dressage and show jumping tests the Pan Am division would go at the end and for the cross country test it would go before the CCI division. These meetings were a good experience by themselves as being able to be part of the discussions with all countries chef's de equip and coaches, as well as the Event director, technical delegate and ground jury at a championship level competition is a great learning experience. That night Trish Gilbert, the event President invited for dinner to her house all of the above mentioned people, as well as some of the top volunteers. Being still the only Mexican that had arrived, she graciously invited me too, although I was the only rider invited. As always Trish was a wonderful host, offering an excellent dinner, and I was able to talk with some of the world eventing key political players, exchanging points of view in this highly polemical times for our sport. A cold front arrived overnight and the temperature dropped a lot, so we had a big frost and when we arrived to the stables at seven o'clock in the morning it was very cold. 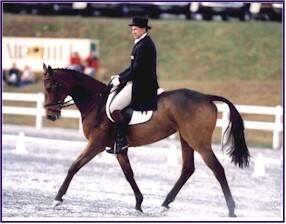 At eight thirty the test ride rider entered the dressage ring and at nine the first CCI division was called to the ring. As Secret had been so nervous in the big arena and trade fair area whenever she had been in there, I decided that she should her dressage lesson in the dressage last warming up zone whenever it would be free to do so. Lunch break was going to be from noon to one thirty, that looked as a perfect time. I called Phyllis to let her know my plan and asking her to be at Fair Hill by then. I went to walk and wheel the steeplechase course, it was a real joy to walk the best steeplechase footing I have ever seen, after riding in more than 15 three-day events. Well before noon we had Phyllis bossing around with a great driving-groom badge hanging from her neck. A soon as the last rider before the lunch break finished his test, I was ready to go into the warm up area, we had an excellent lesson that lasted for about an hour, doing all the FEI test exercises individually and in partial sequences. As soon as Secret cooled down and was settled in her stall, Phyllis, Melissa and I headed to the cross-country start zone. 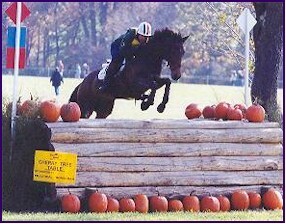 We walked the course, looking for and walking every possible option in all obstacles, being a great asset Phyllis' previous experience riding the Fair Hill CCI course lots of times, although the obstacles were quite changed from some past years. It took us almost two and a half hours walking the course really thoroughly. 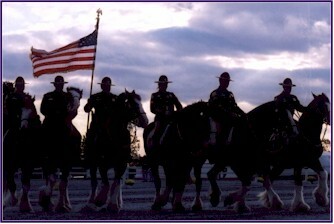 The Police Color Guard at the Opening Ceremonies. A dinner was held for Fair Hill patrons and riders, so we were able to eat excellent food, as in every time I went to any organized event during the weekend. There was an art exhibition in the tent, exposing some works that were going to be auctioned on Sunday, among them Melissa and I found very nice oil painting of a bay horse with a light and dark blue dressed rider landing in a cross country drop, it was Phyllis riding Enniskerry Imp! We showed that night the painting to Phyllis and she fell in love with it. That night when I called my wife Angelita as every day I am in the road do, she told me that my excellent thoroughbred broodmare Cantabria had finally foundered after two months with laminitis due to retaining the placenta after giving birth to her seventh foal, an awesome High Scope gray colt. I told her to put her to sleep if she got worse, an awful decision for any horseman, but one we have to accept and be ready to cope with. With two cars available, Melissa took Phyllis' car early to go to feed Secret. Around eight o'clock Phyllis, my good friend and kiwi horses supplier Joanne Bridgeman and I went to have breakfast in the fancy Elkton McDonald's drive in. The morning was very cold after a big frost, luckily as the day passed it warmed up little by little. After checking Secret, I went to fool around the huge trade fair with Phyllis, finding lots of goodies to purchase, that I wanted to get before crowds came by specially on Saturday. I found the artist who painted the nice oil of Phyllis and Imp, and as I had already decided to buy it as a present for Phyllis for all her incredible support and help to get here, I cut a good price reduction and cut a deal for purchasing it. Suddenly I heard some Mexican-accent Spanish being spoken around, when I turned around my nephew Agustin and my very good friend Agustin Escalante with his American brother-in-law George had already arrived. My nephew had traveled from Mexico City to Baltimore, arriving after midnight, so he stayed in an airport hotel and was picked up by my friend Agustin, who was in his brother-in-law's home in southern Maryland. Although I have a lot of very close friends in the USA, I was truly missing having around some family and Mexican friends. It is a shame that my wife Angelita could not come, but she stayed taking care of our six-month-old baby Santiago and our three-year-old boy little Pedro, who wanted to come with me visit "Secretz his horsey", but it is really difficult to cope with two youngsters in a horse trails competition, specially with the tension and nerves of a championship International Three-day event. An hour before my ride time, we were already going to the warm-up area, trying to replicate Thursday's very successful lesson. The whole warm-up went very well, when we were called to the ring we both felt confident and going well, although when I saw the Mexican flag when I entered the ring my heart jumped. Riding with your home country on the saddle pad adds another dimension to competing in International Events! The whole trot work part of the test went very well, but suddenly when we were almost finishing the first counter canter 20 meters circle, Secret switched leads, I was not able to correct her on time for the following flying lead change and we made a big mess. She got really nervous, as well as me, and we just tried to go through the exercises and get out from the ring. The result was obvious, my worst dressage mark in my past 15 CCIs, a -78! I was disappointed, but it was good hearing my friend Bruce Davidson by the ring exit sidelines cheering me up. I was still truly mad, and decided on going to walk the cross country course alone, with the awful dressage marks, my mentality changed a little bit and I opted for taking some long options. I had been considering taking the fastest routes, but now my objective was completing the event at any cost with Secret in good condition. I did not attend the rider's compulsory meeting, as it was scheduled at five o'clock, exactly when all riders like to do their last cross country walk. That is normally when you decide the final routes at the fences, and have to be really concentrated; besides that, the sunset was around six o'clock. We packed a trunk with all the ten-minute box equipment and spare gear, so we did not have to worry about it in the morning. I got together with my nephew and friends, so we went to have a nice dinner at Buck's, another classic dinner place at every Fair Hill horse trials. We had to wait a little bit for getting table, but it was good fun although George kept crossing his eyes hearing the conversation among a bunch of crazy horse people, being himself a normal non-horsey person, although he kept asking questions and learning about our world. The night was the typical pre cross-country night, waking up a thousand times thinking about how to ride obstacle number 12 the left-handed corner. When I was starting to shave at six o'clock, somebody knocked my door, I opened and found my best friend Alfonso freezing. He arrived to the hotel at two o'clock in the morning flying from Mexico City and started pumping me up, something I have done for him before some of his cross country rounds. It really feels awesome to have some of the people you most like supporting you, especially Alfonso who was the only Mexican rider who completed the Winnipeg Pan American Games 1999 three day event. Leaving the hotel, I saw my USA vet Dr. Sean Bowman's and my USA farrier Steve Mayer's trucks, giving me a great confidence feeling of being with a very able and experienced team. I arrived to the stables and Melissa had Secret starting to be ready to go. I put her leather brushing-boots on myself, something I always do at every horse trial with all my horses. 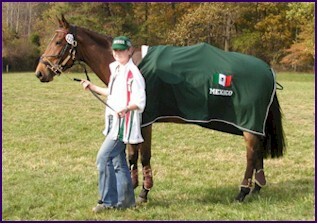 I changed into the Mexican Eventing Team colors: white with green, white and red Mexican flag colored stripes on the helmet cover, hunter green polo shirt and sweatshirt and dark blue breeches. Both Secret and I were finally ready at the same time. We arrived to the Phase A start area with two horses to go before us, so we walked around trying to keep Secret as quiet as possible as she knew very well that the big fun was about to start. The first part of Phase A went around Fair Hill horse trials cross country area, so it is easy to imagine her mind frame, having competed there just two months before in the Open Intermediate division as her first fall season competition. We cantered the last kilometer of the phase to get ready for the steeplechase, pumping up her and getting another extra minute before the start of phase B, other than the compulsory minute. Steve and Melissa checked her shoes and we headed for the starting box. She went off at a very good pace and took a "flyer" in the first hedge, giving me a little bit of a Grand National feeling. She felt a little bit the upward slope in the first turn, but we were truly enjoying flying over extremely good footing and taking in stride every fence. Her stride is not huge, so you can not take any hold in the reins at all in order to able to complete within the time at 690 meters per minute. My watch marked exactly the 4:30 optimum time when we crossed the finish line, but later I learned that I push my start button a bit later than the starter and collected -1.6 time faults. I kept cantering until I found my crew, they checked the shoes again and as they were all right and the weather was on the cold side, I walked the first kilometer, trotted the second and so on, arriving to the ten minutes box with four minutes in hand. I am not very much for the new slow speed in phase C, I think horses lose a little bit the edge for cross country, and the rider has to be working out more mathematics instead of concentrating on how he will ride the cross-country course, but we have to adapt and learn to cope with the changes. After going into the "before cross-country holding box", I finally saw my group waving to me, I dismounted and handed the mare to them and went to our camp that had a Mexican flag hanging behind the two folding chairs and tack trunk. Pedro's 'Vet Box Camp', conveniently near the port-o-potties. Phyllis gave me a briefing about how some fences were riding that she had collected from other riders and from Alfonso who was in the middle of the course and sent my nephew Agustin as a runner with the info. Suddenly, Karen O'Connor came to us and asked Phyllis if I needed any input as she had finished her round. She very nicely gave in a minute a review about how she had ridden each fence. 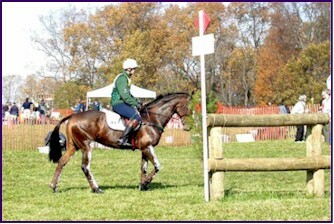 That is one of the great things about eventing, although I was competing against her, she was willing to help. In principle, I think we ride cross-country mainly against the course design not against fellow competitors. Finally, Phyllis repeated to me the way I should ride the turn and approach to my nemesis the left-handed corner; "jumping the table straight, not cutting the turn to the right, keeping my horse in front of the leg, gallop through the turn, looking for my reference point behind the fence keeping Secret truly straight in front of the leg." I saw Secret trotting perfectly all right in front of the panel, so I got on her with three minutes to go. I went beside the starting box and cantered her a circle on each lead getting ready to go. I was not very nervous, and my adrenaline was at 90%. We took off in an attacking mood and jumped nicely the first fence; a beautiful open horseshoe shaped sloping flowers bed with a log on it. We galloped the left-handed turn going quickly close to the ropes, the second fence was a big galloping table that she jumped a little far away, so she had to stretch over it hitting it with both her front and hind legs, giving us a reminder that we were not jumping small schooling fences. The track kept being to the left and the third fence was the first small real question, being a big log pile in the tree line with a substantial drop behind and immediate left turn, so I gave her a good half halt about ten strides before and jumped it beautifully. Fence number 4 came after the sharp left turn and another 90� turn to a pond with two huge wood ducks with white and black painted feathers and red eyes sitting in the water tail to tail, there were about 20 feet of water before and after the jump. Secret entered the water very boldly after a wide turn, but as soon as her front feet hit the water she kind of asked me: "do we have to jump that thing?" but she jumped it very well. Turning left we had to cross again the pond, but jumping a tall log with a big drop behind it, landing in dry footing but having to go immediately in the water for about three or four strides and jump a bank out as fence 6, then in a 45 degrees angle in three or four strides there were two offset little houses in a bounce distance as 7 and 8. Secret jumped well again and I decided to circle around after the bank to approach the bounce with a little more power, something that worked out very well, as the bounce had caused the rider from Bermuda Tim Collins a nasty fall. 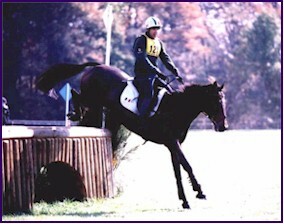 Pedro and Secret at the first Water Jump. Then we had another right-handed turn and a very long gallop to fence 5a-b, two curved related distance oxers with narrow fronts around a maze of a driving marathon obstacle posts below a veranda. 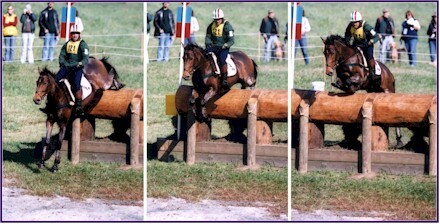 The fast option was jumping to the right a maximum dimensions oxer, turning left 5 or 6 strides to another smaller oxer; the slower option was jumping straight over a smaller oxer, then doing a left-right "S" turn through the posts without crossing your track, as it was an a-b combination fence, and jumping the second oxer of the faster option. I jumped quite efficiently the slower option. In another galloping stretch parallel to the one we just had done lay a "smallish" ditch and brush as fence 10, that has been in place for some years and everybody commented that every year it caught some horses, so I did not ride wildly to it but with the confidence that Secret is very good jumping ditches and we have jumped together some very big ditch and brush fences in the past. Then we had to jump another big table and turn to my favorite fence, the left handed corner, fences 11 and 12. I concentrated on doing everything as discussed with Phyllis, and we were able to do it just foot perfect, hearing a huge cheer from my team at the 10 minutes box that was sitting just in front of those fences. Secret and Pedro clear the oxer and corner combination in fine style. We had the big open gallop to the middle section of the course, where the biggest fences were sitting; a huge oxer with the new frangible safety pins, and a double brush with maximum dimensions and a ditch in front of it, that I was told helped as a take off line, but in reality horrified me. We galloped very fast the whole stretch; Secret did a good job jumping and gave me a lot of confidence that she was tackling big fences with room to spare. Then we had to slow down to jump the smallish log number 15 in the road crossing in front of the trade fair zone. As you had to land in the very steep slope and then go up again, it rode like a coffin, giving the feeling of a fun roller coaster. After a right handed turn came fences number 16a-b, a huge drop bank and at 90� a house with a tree sitting just in the middle of both jumps. You could jump down the bank at an angle and do three strides inside the tree and jump the house in angle too, or jumping the bank straight down and doing a wider turn around the tree to jump the house straight also. I opted for this last option, as the drop is the biggest I have ever jumped down. Then came what Phyllis considered the toughest question in the whole course, a brushes bounce on a slope into water followed by a corner coming out of the water. The "scenic route" was jumping a brush to the left, turning among lots of trees to another hedge into the water with a very slippery approach, to a skinny roll-top on a turn after the water. In this case I took this last complete option, although the straight one jumped quite well during the day. A long uphill gallop took you to a very upright gate fence with number 19, where I slowed down a little bit more than what I had for any other fence on the course. Fences number 20a-b were two identical crescent-moon shaped ditch and walls with arches than made the ditches looked bigger, where you could take both in an angle three strides apart or jump the first then roll back and jump the second. These fences were ones I was very tempted to jump straight, but my depressing dressage result made me less willing to take risks, so Secret jumped very well the turning question with her usual maneuverability. We had another long uphill gallop with some changing footing all the way to the farthest away part of the course where a big Trakehner in a tree line was fence number 21. Maybe because of the shadows or the fact that it suddenly appeared in front of you, Secret did not attack it in her usual style, but we were able to get to the other side. I started to worry about her being tired. As we had to do a U turn into the woods and after going round some trees in a downward slope, jumping a big ditch and rails followed after three strides to a bank up and one stride to a right handed corner with a round face, I started kicking her a bit more aggressively. She jumped the whole thing very well, although I skipped jumping the corner and instead jumped an optional skinny roll top fence beside it in an angle. Once we came out of the woods, in a good galloping zone I was able to make sure that Secret was still "full of running" as the British say, I just stopped squeezing with my legs and letting go the contact, she kept galloping like if nothing had happened. She jumped nicely the big barn fence 23, that later caused David O'Connor to fall down with his second horse and ending up in the hospital losing the chance to keep his gold medal standing after the Pan Am cross country, hard luck that shows that eventing is the greatest leveler in the world. Then came a roll top with a drop landing that did not jump very nicely and after a very confusing tracks crossing we reached the infamous Sunken Road. After being in the right "coffin canter" we attacked it, instead of tackling the bounce to skinny out fence number 25d I had decided for an option skinny fence that was at a right angle on the left side of the straight route fence. Secret thought that after jumping up the bank and going through a gap between some upright tree trunks sitting there, she was ready to go to the next fence. So I had to pull her, stop, turn around to the left and then to right, when we got to the optional skinny she was without any further impulsion and just ran out to the right, something she had never done before in her life. We retook the fence successfully and headed toward a big brush filler fence number 26. We then were galloping down to the last water jump, a big hanging log into the water to another hanging log coming out of the water at an angle, and two strides to a skinny triple brush in a slight angle to the previous fence. A tough question that Secret jumped like a gymnastic exercise. The accomplishment feeling was great. But I did not want to think everything was done, as two quite big fences were still in front of us to be jumped. A big ascending jump over a ditch in a tree line with shadows was the second to last jump and she did it right. A wide wall in the woods was the last fence in the course. After crossing the finish flags I slow her down to a slow canter big circle and then to a nice trot. She was feeling good and I was extremely happy. I dismounted and handed her to Melissa who cooled her down quickly, being allowed by the vets to go back to the stabling area very soon because of her good recuperation. Dr. Bowman reported me that she seemed to be without a scratch. Everybody was very happy and I hugged some people, receiving nice congratulations words from people like Mark Phillips, Jimmy Wofford, Peter Green and my good friend Carol Davidson. I called home to let Angelita know that everything had gone well and I was safe and sound, I do not know how the hell we coped with life without cell phones! Suddenly my great "southern" coach Debbie Adams and her incredibly nice husband Toni Rosetti appeared, they had just arrived to the competition, so they missed watching "The Princess" going around the tough cross country in great style, but I was extremely happy to see them again after some months. I stayed around the area watching some riders go, then we packed all my stuff and took it to the stables, where I changed clothes and headed over to the third and fourth water jumps area to watch the CCI division riders, having great fun in an absolute happiness and relief state. We saw some interesting pieces of riding, both good and bad, but watching cross country at this level you understand why some riders and horses are in the top ribbons more often than others. Once it finished we headed for the stabling area to check Secret. After warming her up a little bit to get rid of any stiffness caused by exertion, we trotted her on the paved strip available close by. She was in Dr. Bowman words "As good as she has trotted at Windchase after going out from her stable on any given day before". So we allowed her to keep resting again and Dr. Bowman and Steve Mayer headed back home in Virginia after they made sure that she was perfect and nothing else could be done. They suddenly announced that I should attend to the riders press conference, very surprised because I was not in one of the top positions I headed to the Press tent, they wanted some foreign rider to give some international flavor, as Americans had literally smashed the rest of the competitors from other countries and I have been quite vocal in every opportunity to speak up. The experience was another good one, added to having been interviewed by the Practical Horseman magazine editor. Event riders need to be prepared to face media and the world to explain why we do this wonderful sport and why we want to keep its current integrity as much as possible. We opened a pair of nice Ribera del Duero Spanish red wine that Alfonso had brought from his excellent Tierra de Vinos restaurant in Mexico City and toasted, sitting on buckets in front of Secret's stable. Then the Mexican team support group headed to the Competitors Party in the big tent, where we had another nice dinner with excellent food. Alfonso very early went back to the hotel to catch up with his sleep and little bit afterward, Phyllis, Melissa, Agustin my nephew and I went to the stables to check Secret once more. We trotted her again on the paved strip, this time with light from Mark Phillip's car, as it was already dark and he was checking the USET horses too. She trotted perfectly all right, so we went to the hotel to sleep. I stopped by the hotel front desk to ask them to do the invoices for me, they told me "don't worry sir, it will take just five minutes in the morning to print them". Melissa went to the competition at five o'clock to feed Secret and get her ready for the Third Horse Inspection, luckily the Pan Am Championship division horses went at the end, although Secret was the second to go in this group. Of course, it took more than half and hour for the hotel clerk to the invoices correctly, but I already knew this was going to happen as it did during the whole week with those people. Around 9:30 we went to the main arena where it was being held again, this time "The Princess" was more quiet and she looked beautiful with perfect braids and her Mexican Equestrian Team green cooler, trotting again perfectly all right in front of the Panel, hearing once again the nice "Secret Notion has been accepted", that meant that we had jumped the second to last hurdle. As I did not want to get messed up with the CCI division show jumping course that was different from ours, I did not even dare to watch a horse jumping it, occupying my time in packing my stuff so we could load it as soon as we were finished. 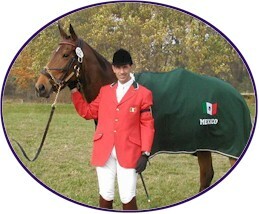 At noon I dressed up in white with my Mexican Equestrian Team red coat to walk the course as soon as it was opened. I did so once with Phyllis and another time alone, it was a big course with some interesting regular show jumping style turns and a very tough bending line. Afterward we had to go in a parade riding in teams groups leaded by ponies, of course we went alone and Secret got really nervous not being able to walk or stand still for a single second. Melissa and Secret, waiting for Show Jumping. As soon as it ended I had to start warming up because I was the third in the starting order. The warming up area was a who's who in the equestrian world, with even George Morris being around. There were four fences for riders from five different countries and all coaches moving up and down the poles, a truly nerve wrecking experience. Secret was well in front of my leg and jumped very well a few fences, once we went in the competition arena she was still going forward, something that gave a lot of confidence as she had been dying off once in the ring in previous horse trials show jumping phase. This time she was so forward that it became our undoing, being a bit too aggressive costing us two down because of it. Besides that, we did not ride well the roll back from fence 3 to fence 4 a triple bar, having to jump it left to right instead of the better right to left approach. It was followed by six strides in a left curved line to a square big oxers in-and-out, where I did five strides, getting too close to the first oxer, which caused us to drop poles in that one and the following two fences. At least we were one of the few to finish inside the time, being a bit of a consolation to know that just two horses were clear, and of those, just Darren Chiacchia was inside the time. But Secret jumped confidently and we completed the course, and our first CCI***! Secret and Pedro in the Show Jumping. Any way receiving my completion ribbon felt like an accomplishment, especially with a 100% sound horse! Immediately I went to pay and pick up Phyllis's painting to give it to her. When I gave it to her she became as emotional as I had ever seen her, it is a real achievement to train a foreign guy who just comes up for competitions with a preliminary horse and making them complete in good style a three-stars Championship three-day event in just two years. I cannot imagine what she could do with a willing rider with a decent horse who can train in a regular basis. Melissa and I loaded the trailer in an organized way, because I had to unload Secret's gear at Windchase and leave it ready to be sent to Florida early next year, as well as leaving all my other two horses stuff ready to go to compete at the Virginia Horse Trials the following weekend. All this because my plane from Dulles to Mexico City was leaving at seven o'clock the following morning. We arrived tired to Windchase, unloading and reloading everything as quickly and efficiently as we could, heading then to Phyllis' and her mother Grace's house to have a great dinner and opening a pair of champagne bottles. Thanks to all Windchase Team! Another dream they helped me get accomplished.